I'm a huge lover of statement jewellery. I get palpitations if I leave the house and realise I don't have any of my jewels on. Throwing on a chunky necklace is the easiest way to turn jeans and a t shirt into an 'outfit' and makes you look like you've made effort in the outfit planning, but it only actually took you 10 seconds. Here are my top picks of bug/ animal jewels from the high street. 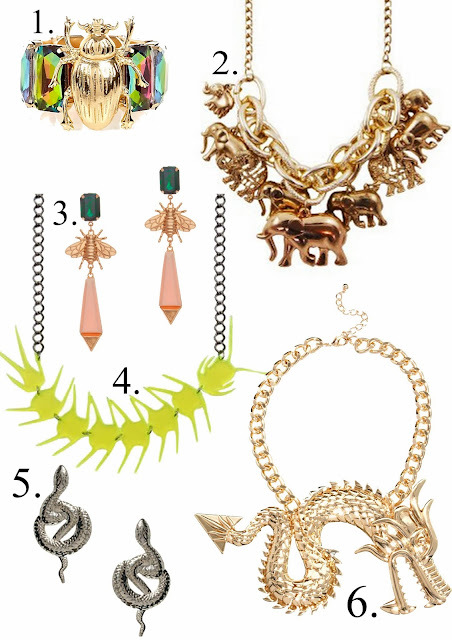 My faves: The elephant necklace from Chelsea Doll and the emerald drop bug earrings from Bijoux Bazaar.